MAC Cosmetics has the best flaw concealer NW. While I prefer to buy discount cosmetics, the MAC concealer is one beauty product worth the cost. Use a good moisturizing skin cream first, then apply NW before foundation. Cover flaws and wrinkles! Concealer is the #1 most important Makeup for Mature Women skin flaws, discolorations and wrinkles. MAC Conceler is the best I’ve found for the price. Apply foundation after NW. Concealer is by far the most important makeup item for mature women. Concealer is the most important corrective makeup as it covers flaws and blemishes at the outset of your makeup application process. MAC studio finish concealer really works amazingly well and it lasts a long time. If you have been reading my blog then you would know that I believe in saving money on beauty products including makeup. I think most makeup can be purchased at the drug store and not at the expensive makeup counter. But there are a few exceptions. Concealer is one of them. Concealer is the number one most important makeup step that happens before you start putting makeup on. If you have an excellent concealer that works well for your skin, then everything else is a piece of cake and inexpensive makeup will work fine as long as you choose the right colors. The only two expensive makeups you need are a good concealer and a good eyeliner pencil. I will discuss eyeliner pencil in a separate post. The reason you need a good concealer is that it is the covering step of the makeup. With mature skin, you are going to have way more skin discolorations that happen with age, wrinkles that happen with age, and flaws that happen with age. The best way to look years younger is to have an awesome concealer that can even out the whole canvas of your face and get your skin looking allover one color and beautiful prior to applying the makeup. Once you have this step mastered then the entire rest of your makeup application becomes really easy. You overall skin tone and beautiful looking facial skin is the key to looking youthful. What I like about the MAC studio finish spf 35 concealer is that it is lightweight and creamy, yet still opaque enough to cover absolutely all flaws. I am not so concerned about the spf in the concealer. While convenient to have it, I usually wear sunscreen either under my makeup or over it or both if I will be going in the sun. I also cover my chest, arms, hands and everything exposed when I put the sunscreen on so it is not critical for me to have sunscreen built into the concealer although it does not hurt anything either. Mac studio finish concealer agrees with my sensitive skin and it does not have any fragrance that I know of, and it stays on literally all day long. It is so creamy that you don’t need much of it to cover your skins discolorations and imperfections. What I like the best is that it covers the color of dark eye circles/dark skin perfectly. It also covers any kind of acne or in a mature women’s case, skin blemishes. It has antioxidant derivatives of Vitamin A and E as well as Silica which supposedly helps to absorb the skin’s oils. The concealer comes in various shades. I get two different shades of it, NW15 and NW20. You can apply the concealer with a brush, sponge or fingers. I use a makeup sponge to do it. I start with the lighter one, the NW15. This is very light and effective for covering the color of under eye bags (that grey/black color you might be familiar with). I go over all the darkened areas with it, like around my eyes and nose and chin. I only need a little bit of it on the sponge for coverage. The NW15 is rather light in color and while it covers the darkened skin it is sort of whitish so next I use a bit of the NW20 and go over everything and blend. The NW20 is darker and more skin toned. The combination of these two concealers works wonders for my skin and I literally can’t live without them as they give my skin a uniform beautiful flawless coverage. 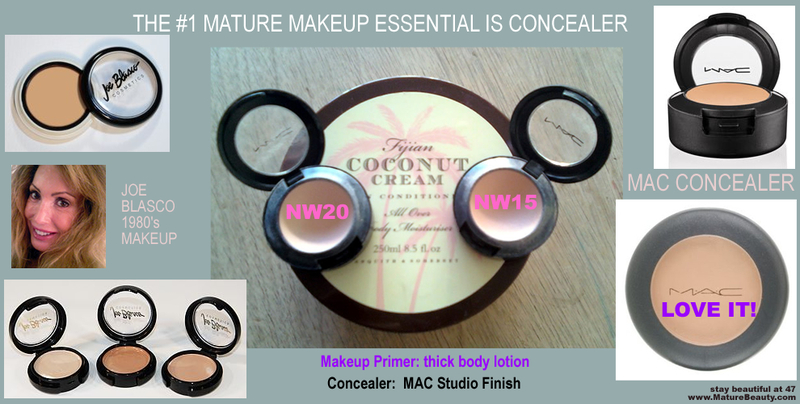 I have a teenage daughter who also swears by MAC concealer, she uses the NW20 with a makeup brush. There is one problem with the concealer. It is really thick and creamy. It is not liquidy whatsoever. If you have dry skin like I do, this can go on sort of dry feeling. Here is what I do. I always, always take a dab of body butter cream and apply it all over my entire face before I start with the makeup (including the concealer). I put a very light coat of the body butter cream over my entire face after it is clean. What this does is act like a makeup primer for me. It softens up my skin a bit. That way, when I put the Mac studio concealer on, it glides on really smooth and has good adherence. Having soft skin prior to makeup application helps your makeup last all day long. Many makeup companies actually sell lotions and creams that they recommend for pre makeup priming of the skin. I can see why they sell that because if you have a touch of lotion on your skin the makeup glides on better. I don’t have the money to spend on primer so I just use a dab of body butter as the primer. So, my one important tip for anyone using the Mac studio finish concealer is to prep your skin with a small dab of thick lotion to make it more emollient and then the concealer will go on smooth and adhere well. I’m a big fan of saving money and using drugstore makeup but in all honesty I’ve tried all sorts of different conealers, from the type that are liquid to the type that look like a lipstick to anything in between. I have never ever been able to locate a less expensive concealer that does for me what the MAC concealer does. I have this little theory (and its pure wild speculation on my part) that the Mac conealer is copied or got its idea from this company called Joe Blasco. Joe Blasco was a cosmetic company that appeared in the early eighties and you could buy it in the beauty supply store. They actually had a really good concealer that I used to use before switching to MAC. Joe Blasco is actually a beauty school and their makeup is still available online. They have this Dermaceal Light concealer that conceals intense skin discolorations like age marks, stains, veins, freckles, acne, capillaries, etc just like the MAC concealer does. The stuff is so good it can even cover tattoos. Surprisingly it comes in almost the same exact container as the MAC. Maybe MAC got its awesome concealer idea from Joe Blasco! I looked up Joe Blasco concealer online and while it’s the only one that is good like the MAC one, the Joe Blasco concealer costs $26.60. It is actually more expensive than the MAC one and that’s why I am a serious convert to MAC concealer. I’ve also watched this Bare Minerals informercial on T.V. with Leeza Gibbons and they include a concealer with the bare minerals makeup kit purchase. The bare minterals concealer looks to me to be similar in nature to the MAC concealer, and Joe Blasco concealer, that I talk about here. However I am not about to buy the whole Bare Mineral package because the concealer that they sell with it comes in a teensy tiny container that is even smaller than the Joe Blasco and MAC tubs. No price break there (and I think infomerical products are overpriced and overhyped anyways). Believe it or not, the one MAC makeup that is a really good price and worth the money you pay for it is the Studio finish concealer. I have to stop by a MAC store once or twice a year for replacements. I use a combination of two colors and both containers of the concealer lasts me around 5-6 months or so. It really lasts a long time because you only need a tiny little bit to get coverage. Each concealer costs $16.50. If you buy two different colors of it then that means you are spending around $30.00 twice yearly or $60.00 per year which means five dollars a month. This is well worth it to me, because as long as I have this concealer I can buy all the rest of my makeup at the drugstore and still look amazing. Sure I would love to shop at Sephora and Christian Dior, but it is just out of my league. I stick with MAC concealer and drugstore makeup to save myself money because it is all I can afford. I like the convenience of the MAC because it is so easy to find a MAC store or Nordstrom’s where they sell it at the local mall. If I know I am running low on it I pick up replacements. I’m totally in love with the MAC concealer. Of all makeup, concealer is the most important for a mature woman. Try different concealers to find what works best for your particular skin. You have to try different brands to find out what really works. Try putting a dab of lotion that agrees with your skin on before you conceal to prime your skin and get smooth adherence. Once you find the perfect concealer product, you can save a ton of money on your makeup because if your concealer is good everything else looks significantly better. As long as you have a good concealer you can get away with buying the rest of your makeup from the drugstore and that can add up to substantial savings over time.